We at KPJ Kajang Specialist Hospital would like to extend our warm welcome to you with hopes that your stay with us will be a pleasant experience. We promise to deliver the best service and care and we hope your stay with us will be as comfortable as possible. We dedicated ourselves to fulfill your needs and to attend to you in an ethical, efficient, professional and caring manner. KPJ Kajang Specialist Hospital is the 17th hospital owned and managed by KPJ Healthcare Bhd which is the Healthcare Division of Johor Corporation (JCORP) and one of the leader in Malaysia's challenging health care industry with 25 private specialist hospitals in the group. 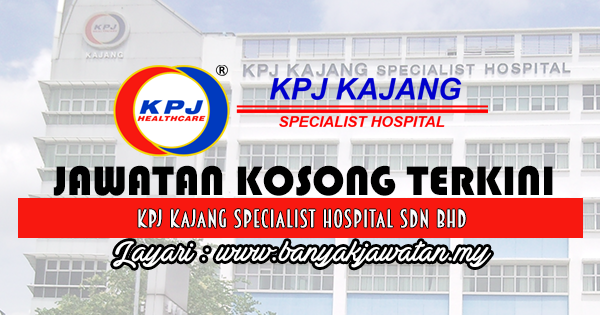 KPJ KAJANG has been in operation since 15th February 2006 and it is strategically located in Kajang town is set to create a benchmark in providing excellent and quality healthcare services. This eight-storey hospital which has 132 beds with its host of Consultants, medical staff and management personals are committed to render the utmost warm, efficient, compassionate and personalized patient care for the well-being and recovery of patients. Candidate must possess at least Diploma/Advanced/Higher/Graduate Diploma, Bachelor's Degree/Post Graduate Diploma/Professional Degree in Engineering (Environmental/Health/Safety) or equivalent. 0 Response to "Jawatan Kosong di KPJ Kajang Specialist Hospital Sdn Bhd - 27 Ogos 2018"